^ 2.0 2.1 2.2 2.3 2.4 2.5 2.6 2.7 Griffiths, David J. Introduction to Quantum Mechanics. Upper Saddle River, NJ: Prentice Hall. 1995. ISBN 978-0-13-111892-8. ^ Lieb, Elliot. THE STABILITY OF MATTER:FROM ATOMS TO STARS (PDF). BULLETIN (New Series) OF THE AMERICAN MATHEMATICAL SOCIETY. 1990, 22 (1). ^ Lieb, Elliot. 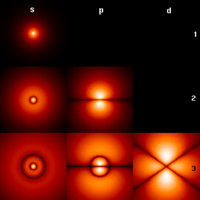 The stability of matter (PDF). Review of Modern Physics. 1976, 48: 553–569.